Interested in Career Opportunities with Hunt Military Communities? Hunt strives to provide service members and theirfamilies with expertly designed homes and vibrant, welcoming communities that make life comfortable, convenient, and enjoyable. The passion for what we do is sparked by the fact that we are one of you. Many of us have personally served in the military while others have a family member or close friend who has served or is serving our country. This special bond with the armed forces allows us to understand first-hand some of the challenges military families face and helps drive our desire to take care of everyone who is a part of a Hunt Military Community. We aim to provide more than just housing. We are entrusted to create quality communities that meet the needs of our residents and we take that responsibility very seriously. We are deeply committed to honoring and serving these heroes and their families. When you live at a Hunt Military Community, you'll always feel at home. Hunt Military Communities (HMC) this month launched a company wide initiative supporting the Month of the Military Child. Held every April and celebrated nation-wide, the Month of the Military Child is a time to honor the sacrifices made by military children worldwide. HMC and affiliates of Hunt Companies will continue to spend the month of April celebrating the military child with special events and programming across all HMC properties. Hunt Heroes Foundation (HHF), the non-profit organization founded by Hunt Military Communities ("HMC"), is excited to announce it raised more than $85,000 at its first-ever Hunt Heroes Foundation gala. The event, recently held in Charleston, SC, included dinner, a silent auction, and an awards ceremony. Thousands of Coast Guard service members and families faced financial hardship as a result of the recent government shutdown. 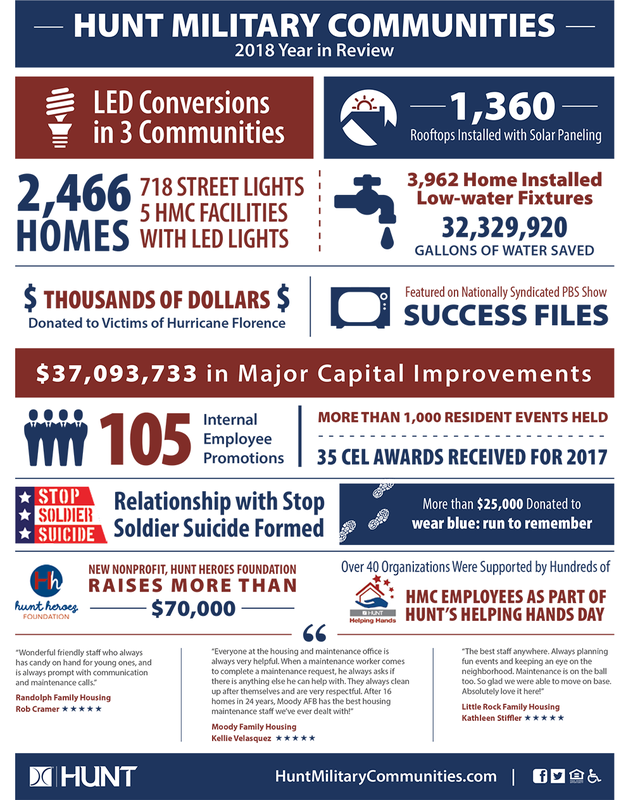 Hunt Military Communities (HMC) and its non-profit arm, Hunt Heroes Foundation, organized to provide support across all of its communities. Hanscom Family Housing, a Hunt Military Community, is honored to announce its employees have been "coined" by the Coast Guard Commander Captain Eric Doucette, and in the presence of Hanscom Wing Commander, COL Chad Ellsworth for helping support Coast Guard families impacted by the government shutdown. Being coined by military leadership is one of the greatest accolades a person can receive. Hunt Heroes Foundation (HHF), Hunt Military Communities Mgmt., LLC ("HMC"), nonprofit organization is excited to announce it has recently started accepting applications for its annual HHF scholarship grants. Hunt Military Communities Joins Forces With Nationally Recognized Stop Soldier Suicide. At Hunt, we aim to provide more than just housing. We are entrusted to build quality communities that meet the needs of those in uniform and their loved ones, and we take that responsibility very seriously.